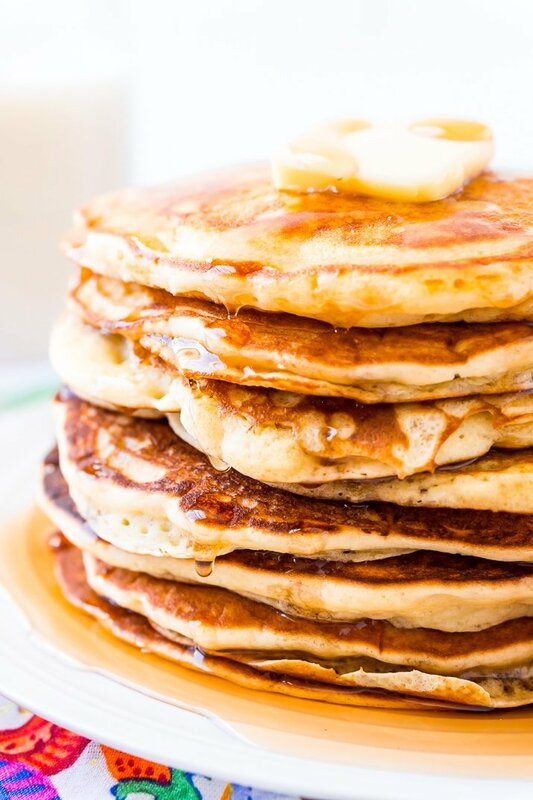 The Best Homemade Buttermilk Pancakes are the perfect weekend breakfast! They’re made from scratch and super fluffy and buttery and delicious! Just top with butter and syrup and you’re golden! I’m honestly shocked that it’s taken me over five years to publish my recipe for buttermilk pancakes. I mean, they’re one of my all-time favorite foods and I’m sure they’re a popular breakfast in your family as well! 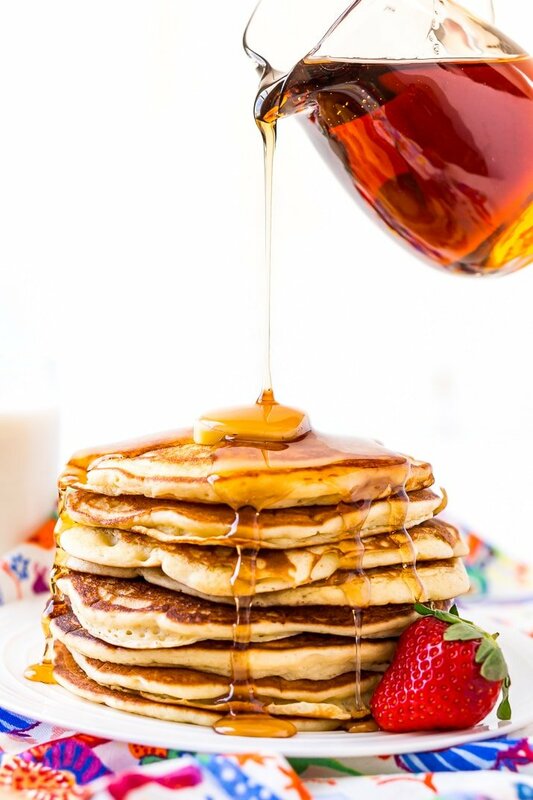 I love pancakes because they’re the perfect vessel for maple syrup, and I REALLY love maple syrup, but that’s not the only reason. In all actuality, I love that they’re fluffy and buttery, and always manage to hit the spot. 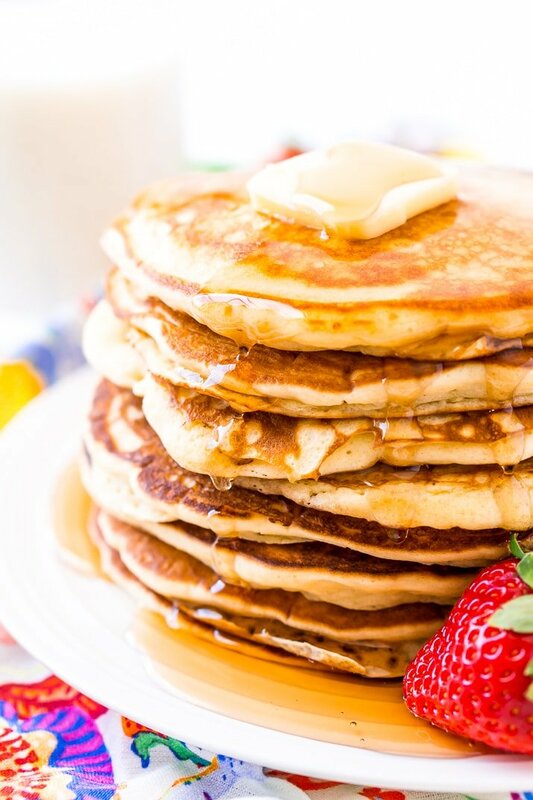 This buttermilk pancake recipe might actually be the ultimate comfort food in my book, be it breakfast or dinner. Because who doesn’t love breakfast for dinner!?!? My parents made us pancakes a lot when we were growing up. Sometimes they were from a box mix, sometimes they were those “just add water” mix bottles when we were traveling, and every now and then, we made them from scratch, those ones were the best! My parents still make homemade pancakes 2 to 3 times a week… remind me again, why did I ever move out? These days I’m lucky if I can get Matt to make them for me once a month. There are a million ways to make pancakes, this is one of my favorites when I’m looking for classic fluffy pancakes. I like to start by preheating the oven to 200 degrees F and place a large baking sheet in the oven, I use the pan to keep cooked pancakes warm while cooking off the remainder of the batter. 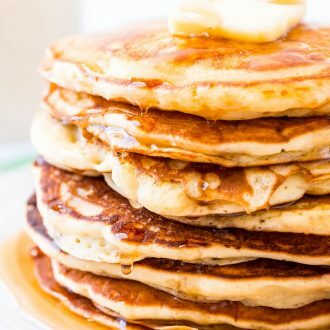 You don’t want to stack pancakes on top of each other right off the griddle because excess steam will cause them to be soggy before you even get a chance to eat them. Next, you’ll whisk together the melted butter (make sure it has cooled a bit but is still liquid), egg, and the buttermilk in a large bowl. Then you’ll sift the flour, baking powder, baking soda, sugar, and salt into the bowl with the wet ingredients and whisk until flour is just combined. The batter will be a little lumpy. Let the batter rest for 5 minutes. While the batter is resting, preheat a nonstick pan or griddle and spray with cooking spray. Once the batter is ready, use a 1/3 cup measuring cup to scoop and pour the batter onto the cooking surface, use the back of the measuring cup to work the batter in a circular motion to spread it out to about 6 inches wide. Finally, Cook until bubbles form around the edges and in the middle of the pancake, about 1 1/2 to 2 minutes. Use a pancakes spatula to flip the pancakes and cook the other side for about 1 minute. Transfer cooked pancakes to the baking sheet in the oven to keep them warm. When you’re all done with the cooking and ready to enjoy your pancakes, you can top them with butter, maple syrup, and fruit. It is very important that you do not overmix your batter, you actually want to see some lumps, if you overmix it you’ll likely end up with chewy pancakes instead of fluffy ones. Buttermilk cannot be substituted for traditional milk or non-dairy milk, other components of this recipe depend on the acid from the buttermilk to bring it together. Let your batter rest for 5 minutes after mixing before you begin cooking. This lets the ingredients activate, leading to nice, fluffy, and delicious pancakes. To get all your pancakes the same size, use a measuring cup instead of pouring from the bowl into the pan. Pin this Pancake Recipe for Later! 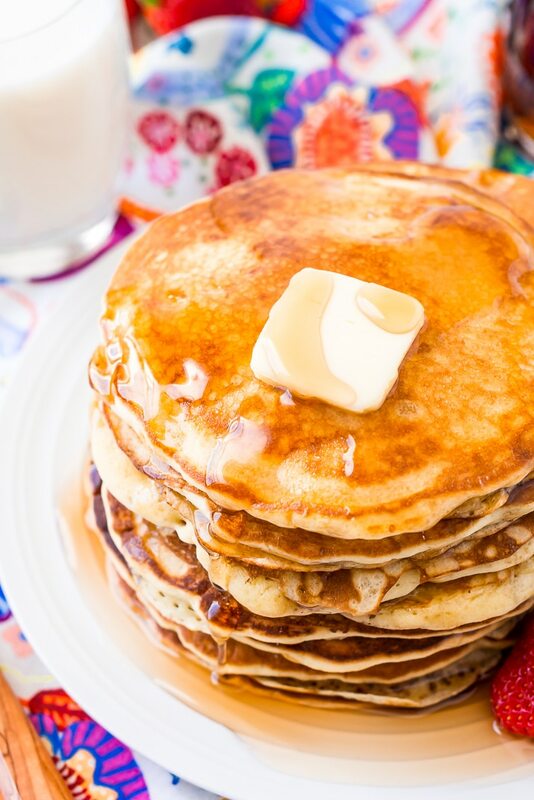 The Best Homemade Buttermilk Pancakes are the perfect weekend breakfast! They're made from scratch and super fluffy and buttery and delicious! Just top with butter and syrup and you're golden! Preheat the oven to 200 degrees F and place a large baking sheet in the oven. Whisk together the melted butter (make sure it has cooled a bit but is still liquid), egg, and the buttermilk in a large bowl. Sift the flour, baking powder, baking soda, sugar, and salt into the bowl with the wet ingredients and whisk until flour is just combined. The batter will be a little lumpy. Let the batter rest for 5 minutes. Cook until bubbles form around the edges and in the middle of the pancake, about 1 1/2 to 2 minutes. Use a pancakes spatula to flip the pancakes and cook the other side for about 1 minute. Transfer cooked pancakes to the baking sheet in the oven to keep warm while you finish cooking off the rest of the batter. 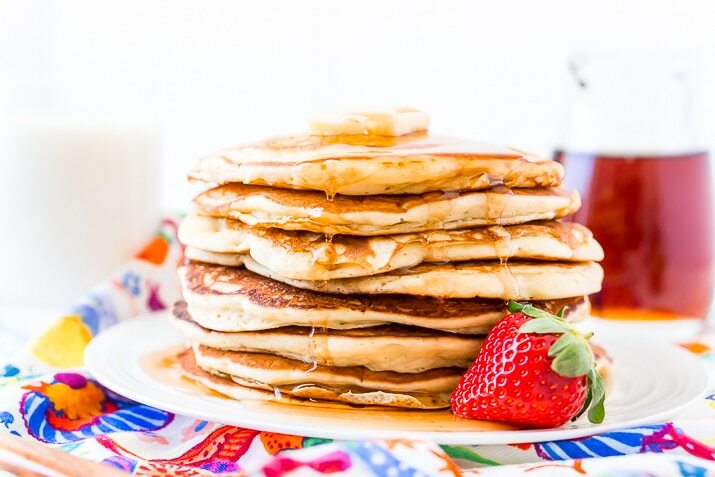 Top pancakes with butter, maple syrup, and fruit. It is very important that you do not overmix your batter, you actually want to see some lumps, if you overmix it you'll likely end up with chewy pancakes instead of fluffy ones. We have pancakes every weekend for breakfast… it’s a tradition! I can’t wait to try your recipe! Sounds like the best of traditions! Enjoy! Who doesn’t love pancakes? These look amazing!